Known as Chiastolite, Andalusite, or the Faerie or Cross Stone. 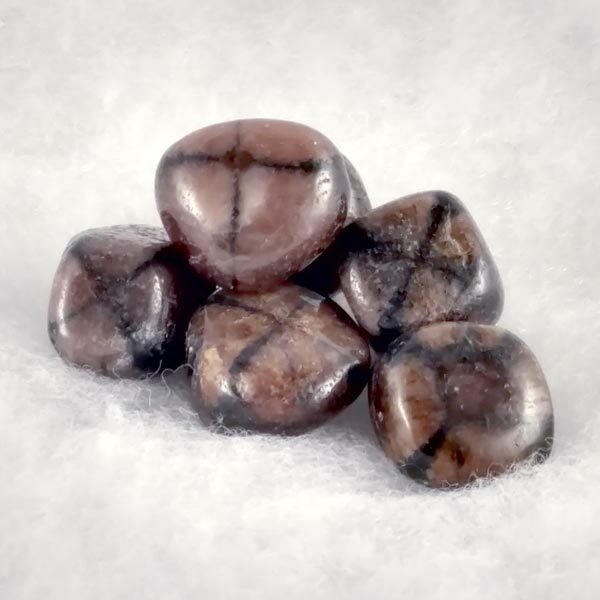 These Chiastolite tumbled healing gemstones have a medium polished finish. Most are in an oblong shape with the 'cross' evident on the end diameter. Size is 1" (some are larger). Chiastolite encourages rational thinking. It enables us to see the different sides of a problem which usually reveals a solution. It is also very beneficial in balancing the four elements in ourselves. Promotes balance, good self-esteem and self-discipline. Aids in being open minded and non-judgemental. Gently encourages use of natural gifts and wholeness. Chiastolite (aka Andalusite) has a orthorombic crystal structure and is in the Aluminum Silicate family. This is one of the stones on the "Do not use in an Elixer" list because of the aluminum in its make up. It is generally formed near granite deposits and is quite plain, and a greenish color on the outside. I first encountered this stone in Fresno, California where it is known as the Faeire Cross (and I honestly have no idea why, it just is). On the east coast of Maine, it is simply known as the Cross Stone and can be found in granite boulders that have been cleared and placed in "farmer's walls" that separate fields. Be sure to ask before you go tapping with your hammer though. So where do the cross patterns come from? The variety of Chiastolite, also known as Andalusite, has formed in cigar shaped bulges that have wrapped around Schist (an altered, super reheated mica, almost black looking). Again, plain on the outside with a green to tan coloring. When these cigar shapes are sliced, the cross pattern appears. Depending on the size of the crystal found, full square patterns have been revealed in crystals that are 3 to 4 inches in their girth. Generally though, most is found in a 1 to 2 inch size, and only the cross pattern is revealed. This is an AWESOME crystal to use when you are out of balance, due to others, situations or just plain old feeling out of sorts. It can be carried in a pocket, but it most beneficial when worn in contact with the skin. Chiastolite promotes an in-depth look at our emotional, physical and intellectual sides and allows us to be unbiased about what we find. What we find just is. We still remain grounded. We just see things as they are and can decide what to keep or get rid of without turmoil. It brings the message that to reach a larger spirituality we must only focus on the intent. Chiastolite encourages rational thinking. It enables us to see the different sides of a problem which usually reveals a solution. It also brings about the realization that self-sacrifice is all right, but not mandatory. Chiastolite can stimulate memory and recollection. Although from my personal experience, it did not effect a person suffering from Alzheimer's. 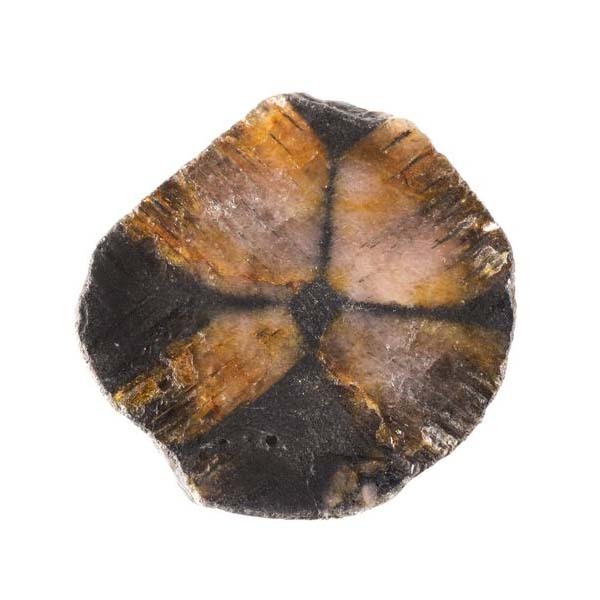 Chiastolite has been used in disorders of the hands and eyes, has been known to improve deficient oxygenation and to promote orderly chromosome development. Chiastolite has a special affinity with the signs of Virgo and Libra. It has a Receptive and Projective Energy, its Planet is the Earth, and its Element is Air. Known as the Cross Stone, many who practice Elemental Magick carry it to help balance the Four Elements within themselves. It is generally carried or worn and is also placed on an alter for power during rituals of many kinds. Like many stones that have a different shape or characteristic, this is one that is also carried for luck. Many Shamans also carry this stone in their medicine bag and then use it as an item to exchange with others during potlatch or give-away ceremonies. The person who gives away the most and carries the burden of their people is one of the most respected members of the tribe.